2014. By Donna Dearborn. A wonderful new memoir chronicling the bond between a daughter and her stricken 75-year-old dad. 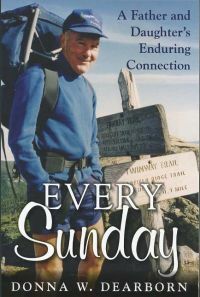 Through a series of weekly visits at her father's nursing home, the author recalls a lifetime of memorable moments once shared by the pair while hiking Vermont's Long Trail, "bagging" New Hampshire's highest summits, and tackling some of New England's toughest ski terrain. "An upbeat, powerful story of a father and a daughter; of love, relationship, and second chances; a story you won't soon forget," raves Brattleboro columist Fran Lynggard Hansen.